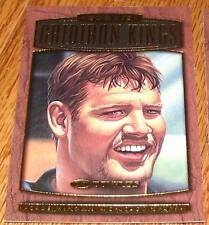 1999 Collector’s Edge Football Card #32 Cade MaNown Graded (PSA) NM-MT 8.0!! We are human, however, and may make a mistake every once in a while. Give us a chance to make it right. They are both in excellent condition. 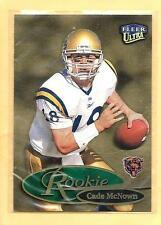 There is a pacific paramount and a Bowmans Best rookie cards. Card is in near mint to mint condition. Card in pictures is card you get. 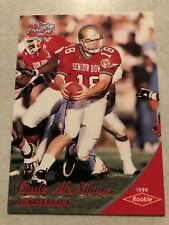 1999 SP AUTHENTIC CADE McNOWN RC /1999 SGC 88/8. Condition is Very Good. Shipped with USPS First Class Package. THIS IS CARD #SC16 IN NM/MT OR BETTER. Player: Cade McNown. Card Attributes: Autograph Rookie. Card Manufacturer: Upper Deck. Manufacturer: Upper Deck. Year: 1999. Year/Season: 1999. Pictures are scans of the exact card you will receive. Original/Reprint: Original.